Adventures With Dogs! An Incredible 8-Day Southwest Tour! How would you like to go on exciting adventures without having to leave your dog at home? Owning a dog is not only a privilege but a responsibility that we have to take seriously. Just like having kids, they are dependent on us and we need to make time for them as often as we possibly can. That’s why for dog owners, it can seem difficult to go on long vacations, or even just to take a weekend break away from home. 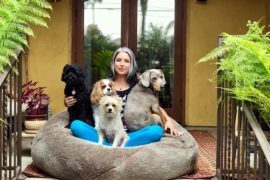 You can always hire a pet sitter, but admit it, you can’t go a day without worrying about your canine pal. Here’s the thing! Now you can have your much needed vacation without leaving them behind. 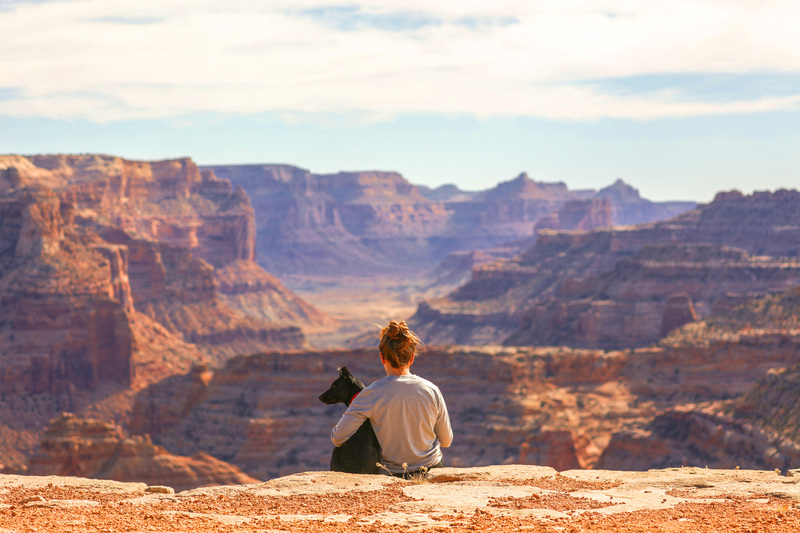 Happy Tails Canine Adventure Tours’ The Coyote – A Southwest 8 Day Tour lets you have amazing adventures with dogs and see the highlights of the Southwest all in one journey! 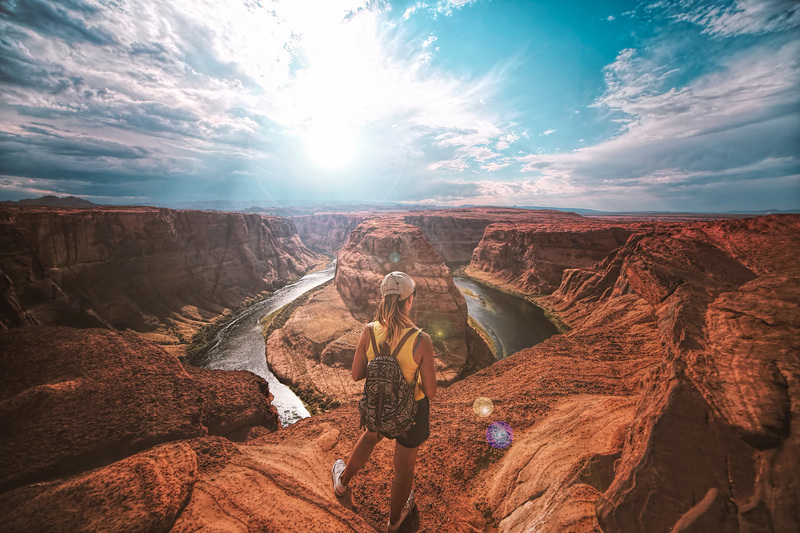 From the 271-mile long Grand Canyon, to the Alice-In-Wonderland-like lunar landscape of Bryce Canyon, to breathtaking Monument Valley, nothing is more memorable than eight days in the Southwest. We’ll take you and your dog hiking, rafting, kayaking, on jeep tours, and other amazing and unforgettable experiences. Dog Adventure in little Grand Canyon. Explore the Southwest in eight days! We start our amazing tour in Las Vegas, where you will be checked in at one of the most dog-friendly casino resort hotels. Happy Tails Canine Adventure Tours owners, David Blank and Claudia Fabrega, will brief you on the next eight days’ itinerary. Then you can spend the rest of the evening exploring the Entertainment Capitol of the World with your dog. On Day 2, we depart Las Vegas and proceed to the Grand Canyon. Along the way we’ll cross over the Hoover Dam, visit Seligman, Arizona (inspiration for the movie Cars), and dine at the wonderful and historic Snow Cap Drive-In with your four-legged pal. After lunch, we depart historic Route 66 and head to the awe inspiring Grand Canyon National Park, where we’ll spend the afternoon taking in one of the earth’s most famous and well-known geologic wonders. It will be one of the best adventures you’ll ever have. On Day 3 we depart the Grand Canyon with a stop at the Desert View area and the historic Cameron Trading Post. Here, you will find authentic Indian jewelry, blankets, pottery, rugs and sand paintings, all produced by the local Native Americans. 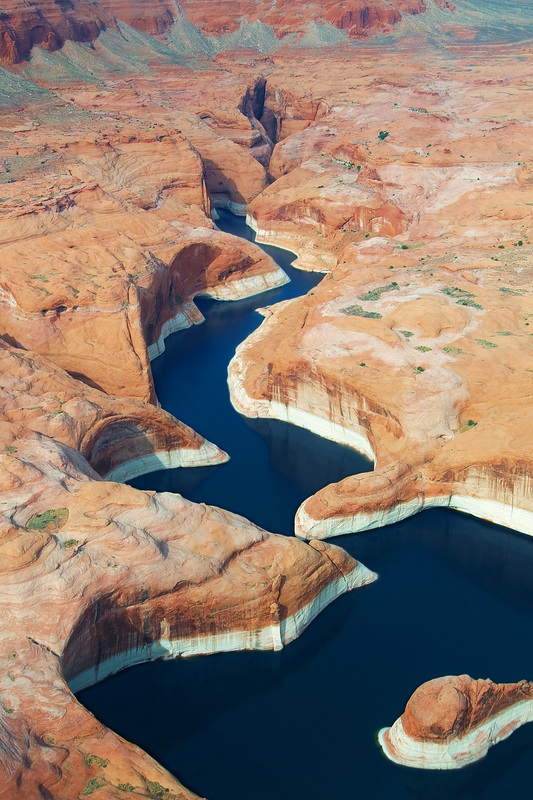 Next, comes the unique beauty of Lake Powell National Recreation Area. After having lunch at the Antelope Point Marina, we’ll enjoy a scenic hike with our dogs to the Horseshoe Bend. On day 4, you and your canine companion are in for a wonderful treat as we navigate through the slot canyons of Lake Powell on our Private Power Boat Tour. We’ll take you to a nice sandy beach to enjoy play time in and out of the water and have a picnic lunch with our fellow adventurers. After nature comes culture. We will then immerse ourselves in the rich cultural heritage of the Dineh people in Monument Valley. A Navajo guide will take us on an amazing scenic tour within the Valley to a variety of famous filming locations. We’re just halfway through what the Southwest has to offer! On day 5, we visit Dead Horse Point State Park where we’ll have another picnic lunch with our dogs and see some of the most spectacular views of the region. Next is the nearby Arches National Park, which serves as a home to 2,000 named arches. We finish the amazing day with an afternoon Jet Boat Ride on the mighty Colorado River through spectacular red rock canyons followed by a BBQ dinner on the banks of the Colorado River. You have an option to go on a hike at the Grandstaff Canyon on the sixth day of our tour, which is one of the best trails for your dog. You are also free to enjoy the rest of the day exploring Moab and experience pet-friendly outdoor activities such as rafting and canoeing. More sites to explore on our Southwest tour’s last two days. On day 7, our first stop will be the Goblin Valley State Park, where wind and water have carved amazing goblin-like sculptures, creating a unique landscape that plays with the imagination. Plenty of rocks and coves are also available for exploration. Next, we’ll proceed to the Capitol Reef National Park for a delicious picnic lunch under the shade of towering cottonwood trees. Then we’ll enjoy a drive at Scenic Highway 12, the crown jewel of the Scenic Byways System. 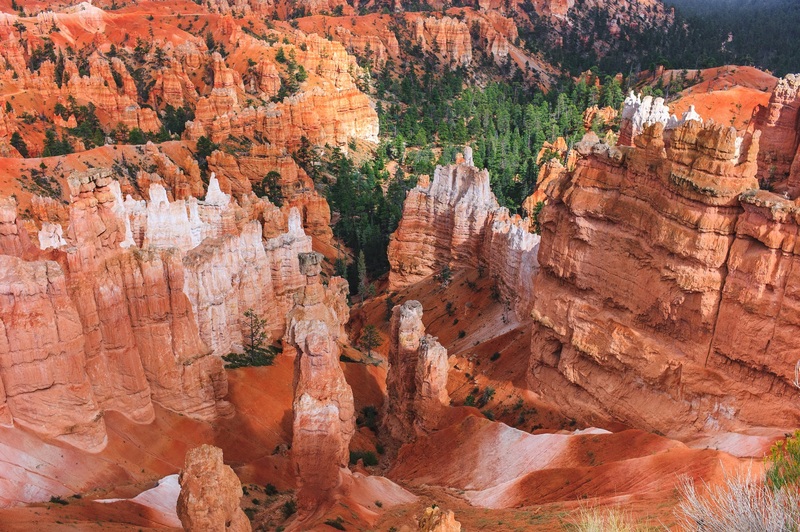 The rest of the afternoon will be spent exploring the beauty of the Grand Staircase – Escalante National Monument and Bryce Canyon National Park. 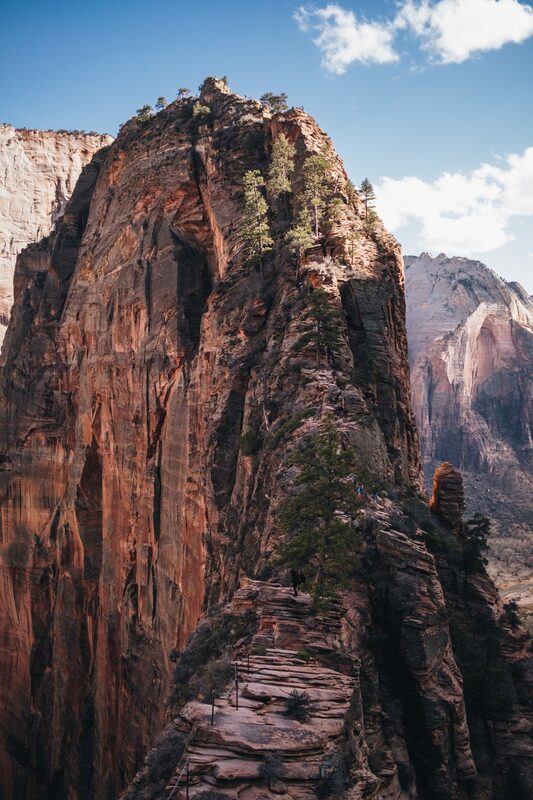 For our eighth and final day, we’ll take you to Zion National Park, where 2000-foot temples can be found. Mischievous spirits are said to live in these towers, adding to the thrill of our Southwest tour. Then we can enjoy a walk along the Pa’rus Trail, a wonderful, dog-friendly trail with a distance of 3.5 miles (round trip). In the late afternoon, we’ll travel back to Las Vegas for a final chance to experience its glitz and glamour. 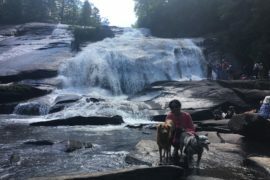 If you’re looking for Asheville tours, or just planning for the next adventure with your dog, then you have come to the right place! After the successful launching of Howl At The Moon and The Fox adventure tours, Happy Tails Canine Adventure Tours yet again kicks off an amazing tour that your four-legged canine pal will surely love. 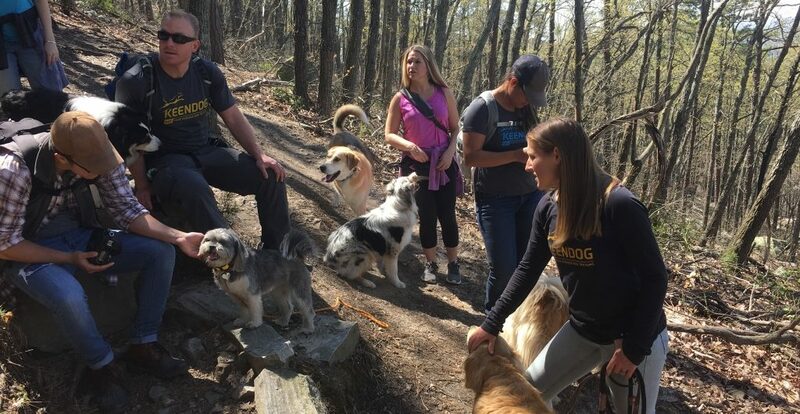 Two days of pure fun and relaxation with just you, your dog and like-minded adventurers on The Hound – Asheville 2 Day Tour. From Charlotte, we will head westward and upward, into the Blue Ridge Mountains and Chimney Rock State Park. Admire the amazing 75-mile vista overlooking the Hickory Nut Gorge and Lake Lure. Following an invigorating morning hike, have a picnic lunch with your canine buddy and relax in the presence of nature. Then we will proceed to Asheville, where more adventures await. Living the life! Our canine buddy is on top of the world – literally and figuratively. You’ll never have to worry about the welfare of your dog – Asheville ranks second in the USA’s most pet-friendly towns. With its great climate, fine dining, wineries, breweries, and wide variety of outdoor adventures to choose from, your dog and you will definitely be living the dream. Discover public art and shop to your heart’s content in Asheville’s walkable downtown. Happy Tails Tours will also take you to the finest, dog-friendly pubs and breweries, where you can spend a laid-back time with your canine pal. Then for dinner, you can pick any location you want. This growing city never runs out of delicious and unique restaurants to try, for tourists and locals alike. Dogs are welcome too! After an exciting day of hiking and exploring Asheville, rest your tired feet and spend the night at one of Asheville’s most pet-friendly hotels.  Happy Tails Tours got you all covered. Having a blast in the snow. 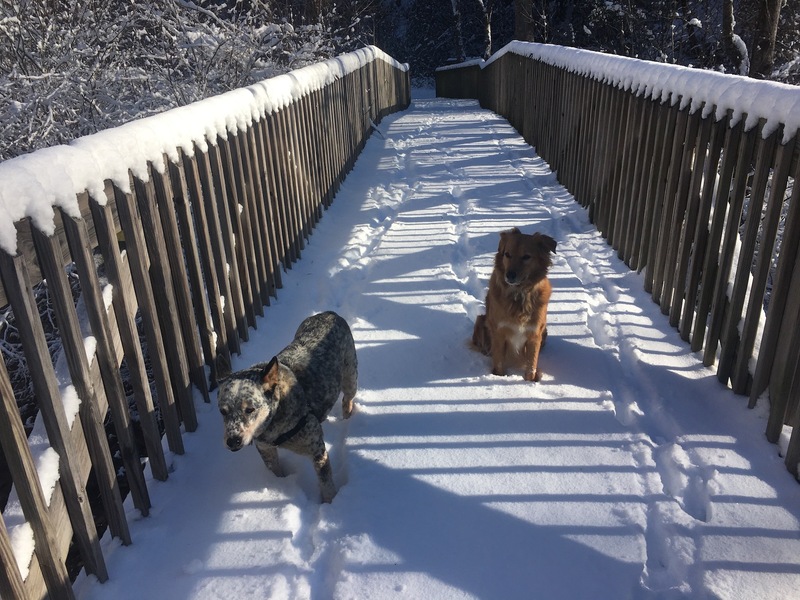 The cold never bothered Margie and Dozer. The second day will be just as fun as the first one! 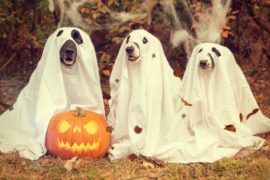 A variety of activities are in store for your dog and you. David, the owner of Happy Tails Tours himself, will take you on a guided walking tour around historic parts of Asheville. 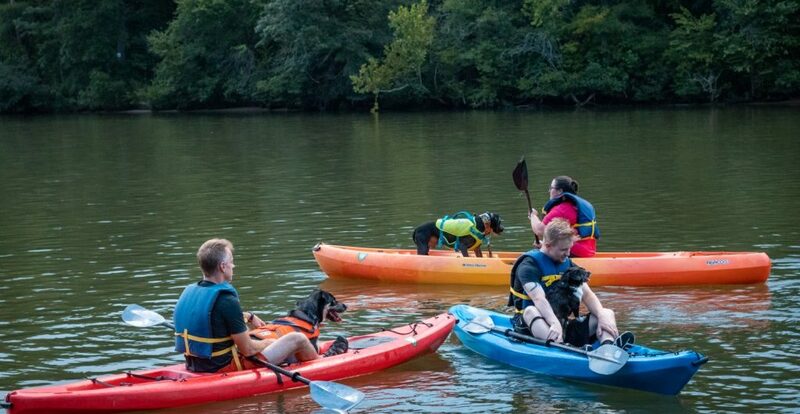 You can also explore downtown or paddleboard with your dog on the French Broad River. Then we’ll take you on a leisurely trip back to Charlotte after lunch. Depending on the season, we can finish off this amazing tour with apple-picking or wine-tasting at one of North Carolina’s award-winning, most dog-friendly wineries. “Row faster, dad.” Margie and Dozer having the time of their lives with David. Sounds good? We only have TWO SCHEDULES LEFT FOR THIS YEAR (Oct. 3 & Nov. 7)! Happy Tails Tours is about having fun while building a deeper relationship between dogs and their humans. It is every dog owner’s responsibility to take their canine pals out on a regular basis, for exercise as well as for their necessary functions. And while we love our dogs very much, we can’t deny that sometimes it can feel a bit tedious and routine to have to walk them. If dogs could talk, they would tell you that it bores them as much as it does us. But what if I were to tell you that there is a fun way to get their furry legs moving? If you’re living in or around Charlotte, we’ve got you covered! Happy Tails Canine Adventure Tours can bring your dog and you on a night full of adventures and amazing experiences. This blog about our Charlotte Tours will give you insight on what to expect and how you can take part in this fantastic and life-changing experience. 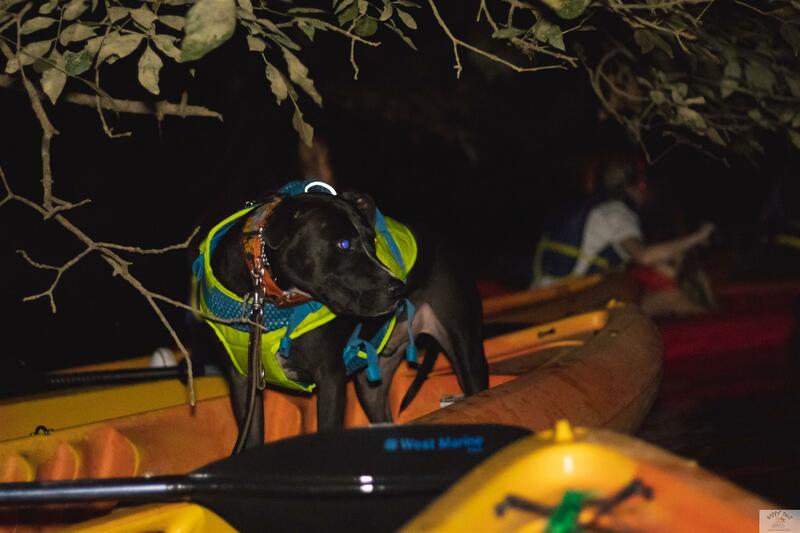 Two of our friends, with their canine pal, explore the river under the full moon. 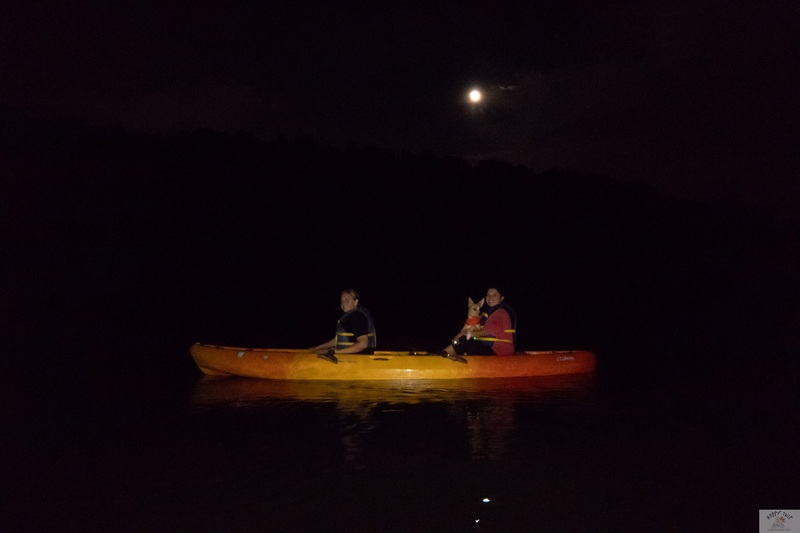 LAST CHANCE TO JOIN The Howl At The Moon – Full Moon Kayak & SUP Adventure tour for this year! We offer a variety of wonderful tours, and one of them is the Howl At The Moon – Full Moon Kayak & Stand Up Paddleboard Adventure. Yes, you’ve read that right. 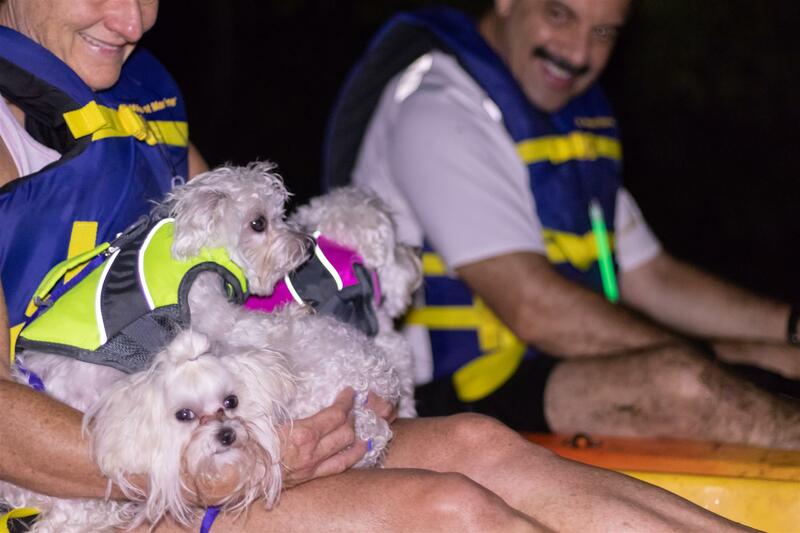 Happy Tails is taking you to the Catawba River to enjoy different water activities while bathing under the full moon. 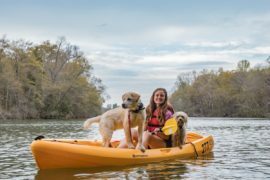 Kayaking and SUP are no longer just for humans; dogs can now enjoy them too. These furballs are having a wonderful, relaxing time on their mom’s lap. 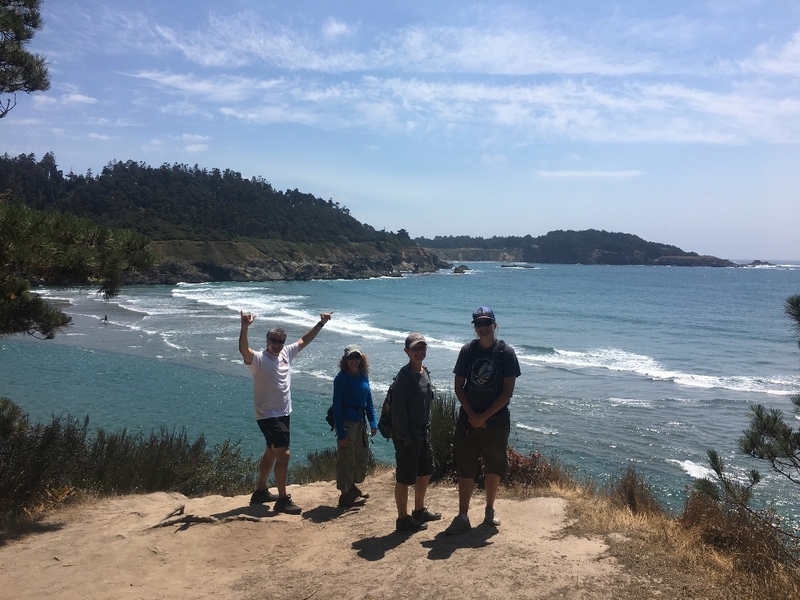 As a tour guide for 20 plus years who bring my dogs on every tour, our co-founder David and his wife Claudia always see to it that the safety of my tour companions is given the utmost importance. 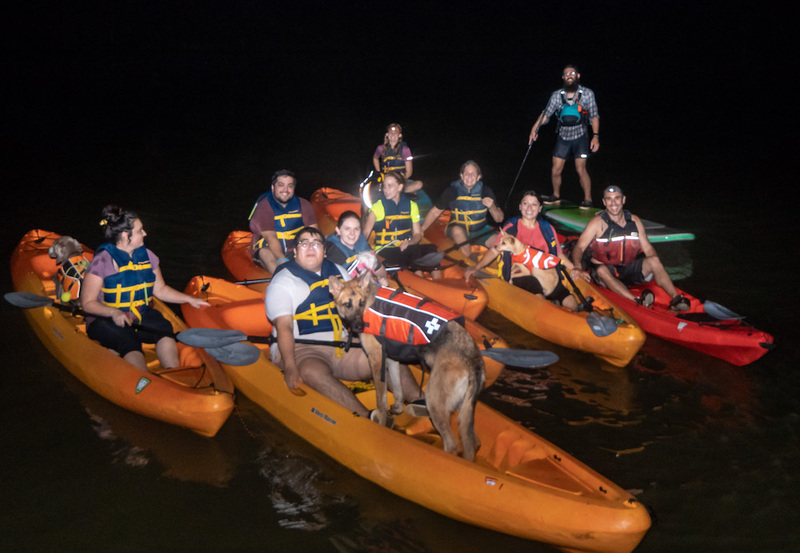 Hence, for this Howl At The Moon – Full Moon Kayak & SUP Adventure tour, which begins at Tailrace Marina at 7:00 in the evening, we start off with a dog and human meet and greet and snacks for all. Next, we have a safety briefing and then get everyone set up in their kayaks or on their SUPs, with all the needed equipment, and then get going. The real fun begins after this, as we paddle and explore the river with our canine best friends. Not scared at all! This brave soul is ready to conquer the river. Whether kayaking and SUP is your thing or not, there is nothing to worry about. We can teach you how to get on your boats and paddleboards. 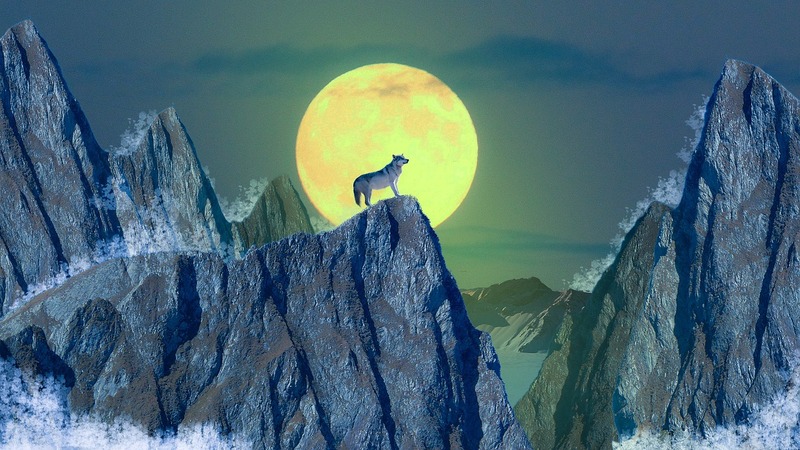 Or you can explore the beauty of nature with your dog under the full moon’s natural light. This is a rare opportunity for your furry buddy and you to marvel at the nocturnal beauties around the river. 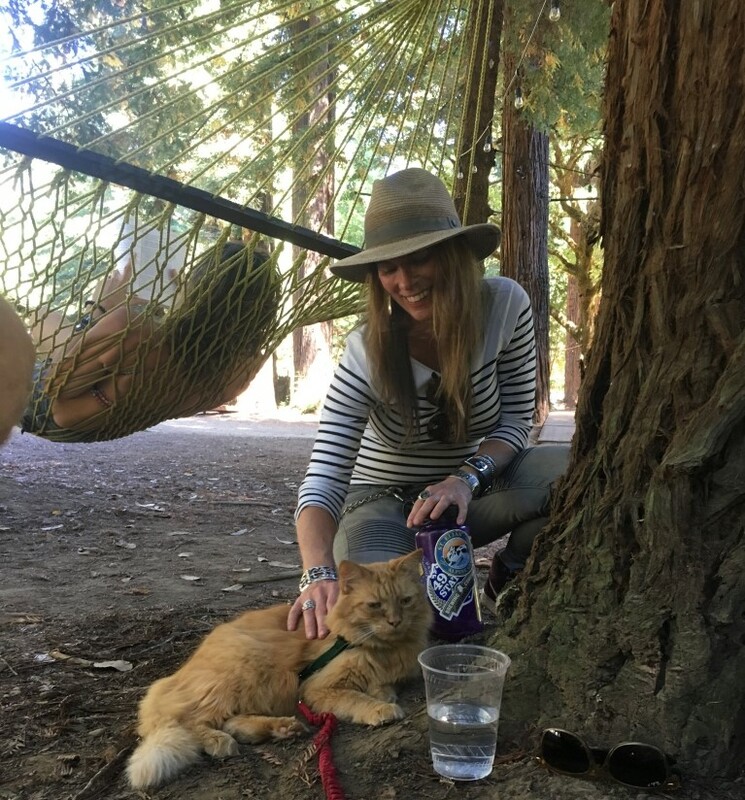 You can also have a picnic with your four-legged buddy while basking in the incredible view of nature. 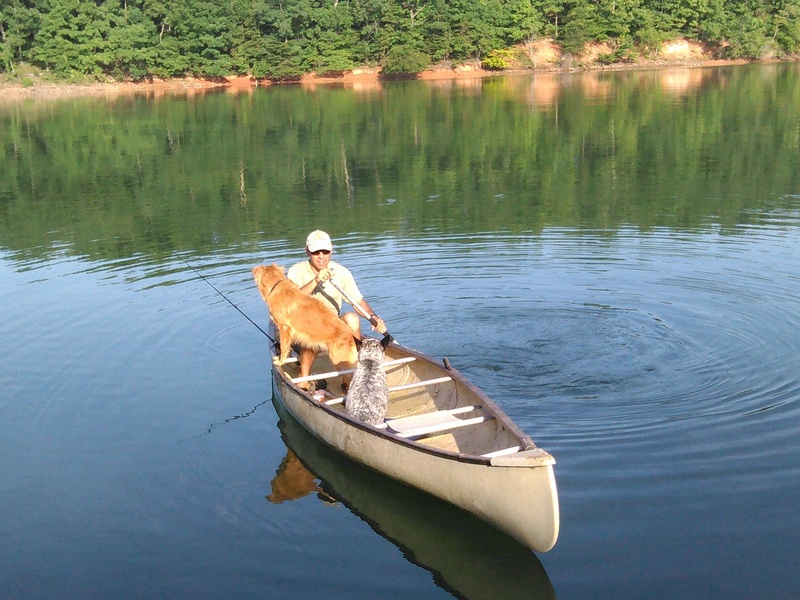 David (red kayak), guides and bonds with the group and their four-legged buddies. While it is a dog and human-focused tour, you do not need to bring a dog in order to participate. We understand that you might just want to hang out with like-minded adventurers and their canine pals. We could even offer you a dog-for-the-day if you would like! Our dogs are special, and they deserve to be treated and pampered at least every once in a while. 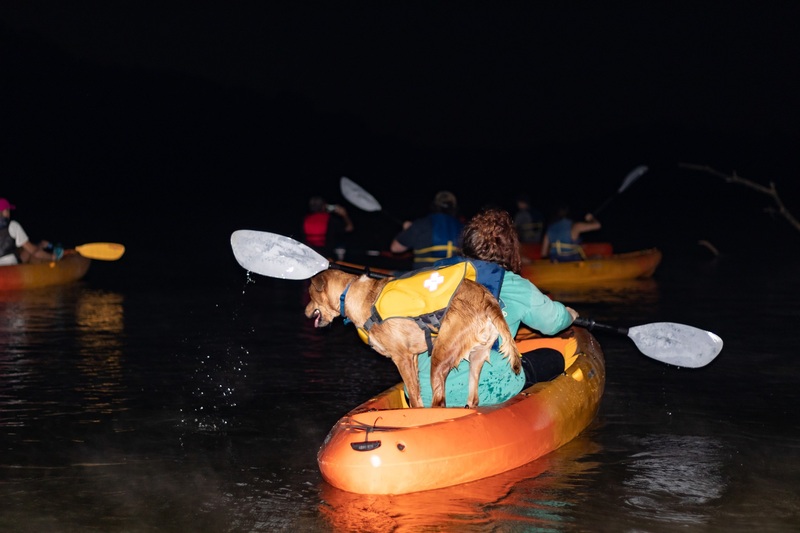 So, join our next Happy Tails Howl At The Moon – Full Moon Kayak and SUP Adventure this September 21 & 22, 2018. Don’t miss out because these are the LAST HOWL TOURS OF THE YEAR! This dog surely loves the river. Traveling is always a great idea. It gives us a whole new perspective that can never be found within the four corners of the office, or even at home. It allows us to start new friendships and renew bonds among old friends. Most importantly, it helps us reconnect with nature and transform our lives for the better. However, for some fur parents who can never leave their beloved dogs alone, traveling seems to be a far-fetched dream. But hey, news flash: Traveling is not just for humans anymore! 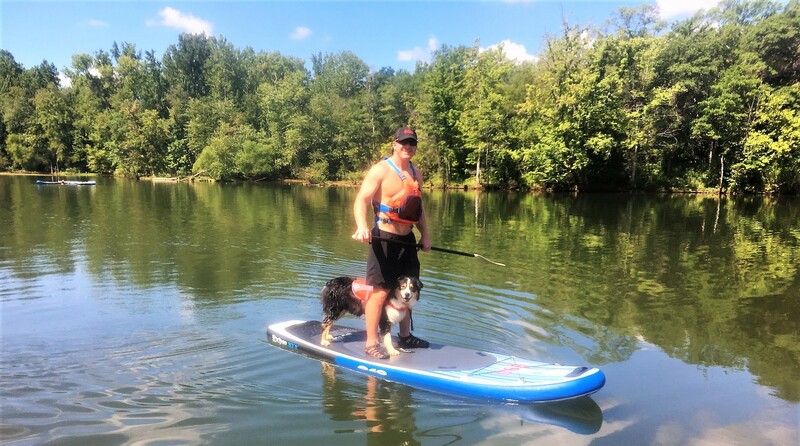 We at Happy Tails Canine Adventure Tours offer you fun things to do in Charlotte NC and a chance to spend time with your four-legged buddies in nature, rather than having to leave them at home. Not only are we dog-friendly; we are dog-focused. We want them to get as much out of the experience as you are! Demetria Mosley of the Gaston Gazette writes about fun things to do in Charlotte, NC, and in her article about our Howl At The Moon Tour, writes about our humble beginnings and the common love for dogs and adventures that made Happy Tails Tours what it is. 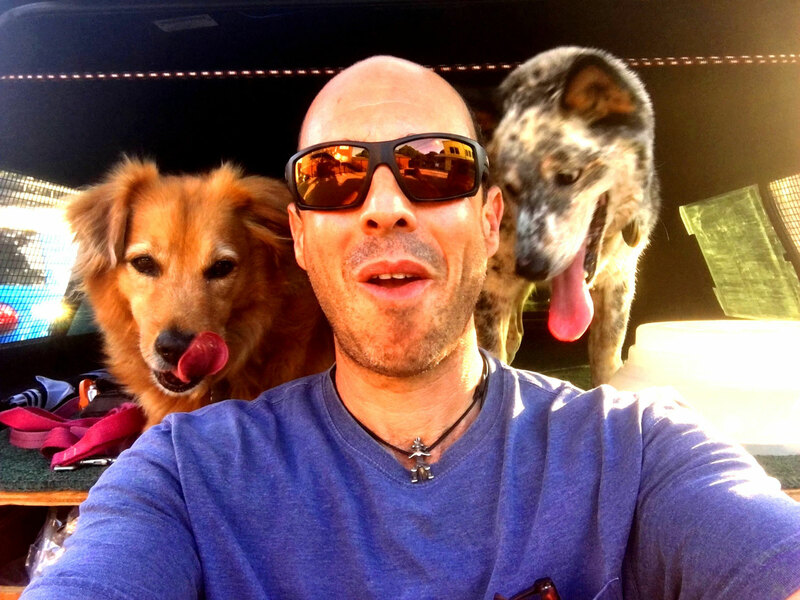 It’s an honor to share how our three cherished canine family members transformed our lives and helped us reconnect with nature. We want you to experience the same too, and for that we are organizing a Howl At The Moon tour by North Carolina’s Catawba River. This event will be on September 21 & 22, 2018. There are many things that have shaped who I am and how I interact in the world, but none more so than travel, at least not until I started traveling with dogs. In 1993, Trek America changed my life. I was 24 years old when after a few weeks of training they handed me the keys to a van, 13 young people from all over the world, and $4000 and essentially said “Drive safe, have fun, and bring everyone back in one piece!” I did, and I was hooked, both on guiding and on travel. 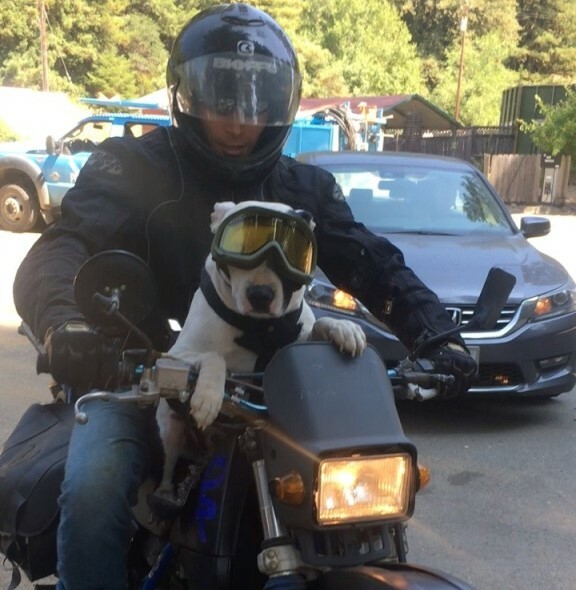 In 2000, when I loaded my dog Max on the back of my motorcycle, my life took its next big turn! 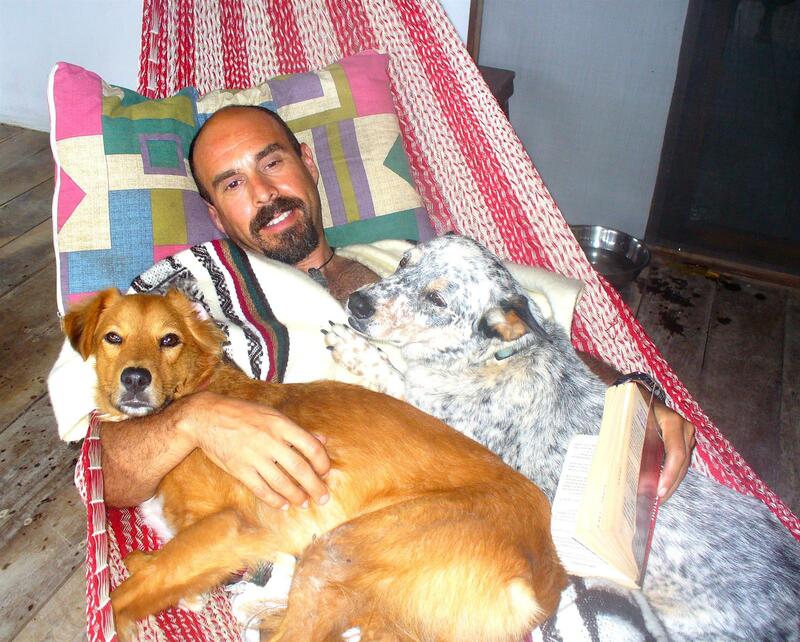 That’s when I began traveling with dogs and really experienced the transformational power of combining travel and animals, and, once we got into the Canadian wilderness a week later, the trifecta was complete! 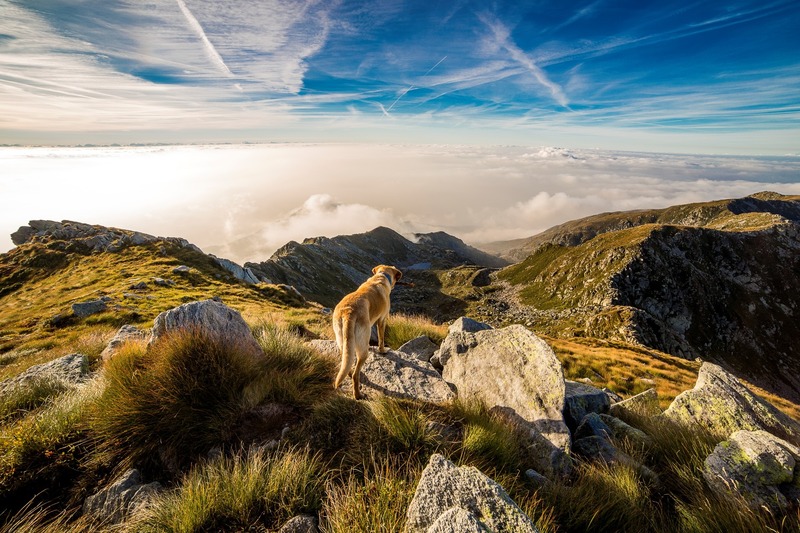 The power of traveling with dogs in nature, and the connection that resulted, was unparalleled in my experience. 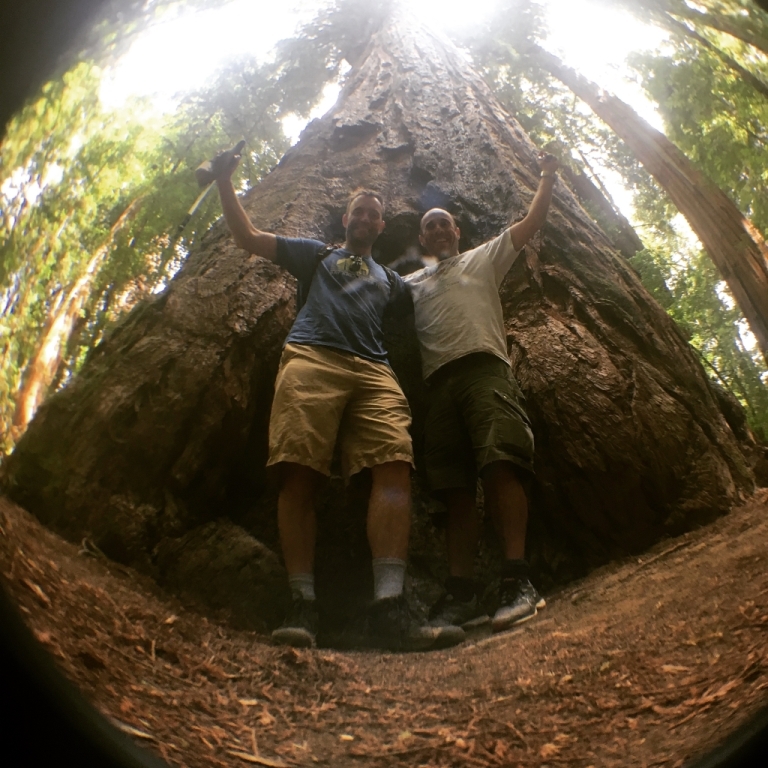 Last week I spent 4 days in the Redwoods of Northern California at a reunion of some of the most wonderful people that I’ve been privileged to share my life with. It was reunion where everyone was family, yet almost no one was related. The reunion was of Trek America tour leaders. There were guides from the early 70’s all the way up to folks who have only been with the company a few years now. Everyone there agreed that Trek and travel had had an amazing, undeniable positive impact on their lives and on the lives of the passengers who it had been their privilege to guide for the past 46 years. And everyone was supportive and thrilled with the idea of Happy Tails Canine Adventure Tours. Because we are all intensely passionate about travel and sharing that experience to transform people’s lives for the better, everyone felt instinctively that traveling with dogs was definitely the next step in the genesis of travel and its power of transforming lives. I could go on about what a great experience it was connecting with old friends as well as making many new friends. Or about how Jack, who hired and trained me in 1992 and put the whole reunion together is an amazing person, role model and inspiration for me and many of us who were there. Both of those things are true and I’m incredibly grateful to Jack and everyone for their love, support and energy! 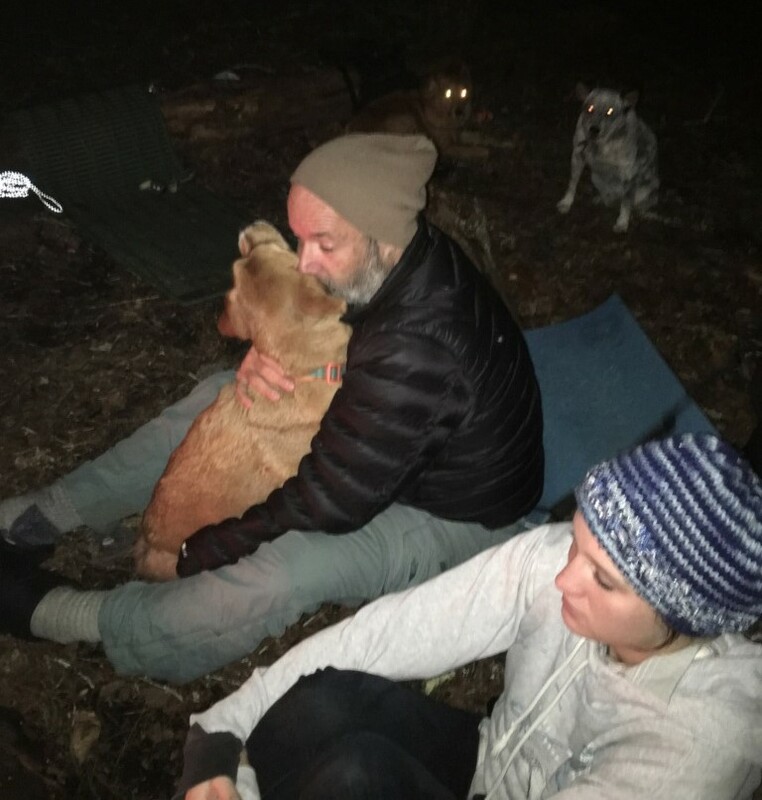 But what I really left the reunion with was clarity about the incredible transformative power of traveling with dogs in nature and an inspiring certainty that Happy Tails Tours is the most revolutionary, most appropriate and most important project I have ever worked on. 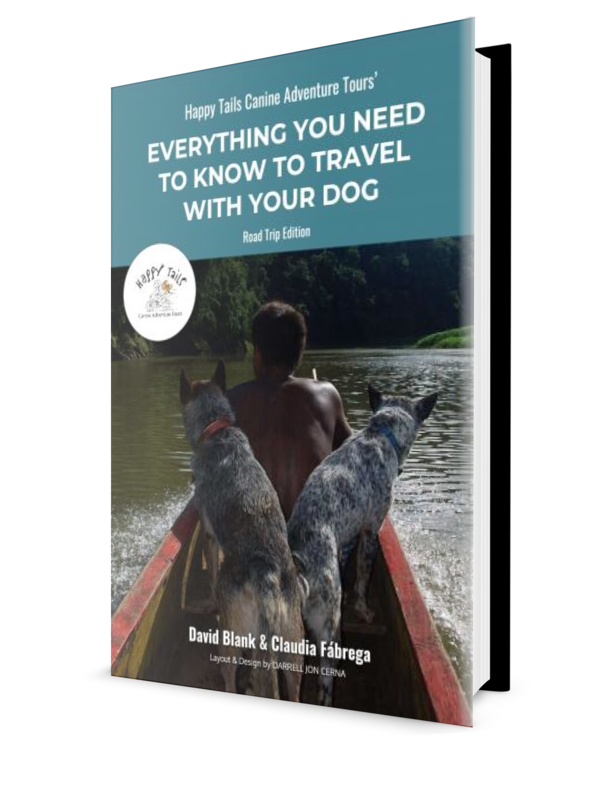 Happy Tails is a culmination of my years of international travel, adventure guiding, studying dog training and learning about people and nature. It’s continued growth and success is a result of not only hard work but also trusting that the roads life has taken me down have been the right ones. As a guide I have been blessed. I’ve gotten to experience so many amazing new and wonderful things, from cities like New York, San Francisco & Vancouver, to Bison in Yellowstone, to hiking parts of the Appalachian Trail, to spending time on a small uninhabited Panamanian island in the Caribbean watching the Pleiades meteor shower, to the northern lights in Jasper National Park in the Canadian Rockies. Even better, I often get to experience those things more than once. And better still, by sharing those incredible things and places with clients, I get to re-experience everything again as if for the first time because I am experiencing it through their eyes. I get to experience the wonder and amazement and excitement, and sometimes even fear, all over again, and it just keeps feeding my soul! Now, with Happy Tails, I get to go deeper! Not only do I get to share the world with people, but also with their dogs. Not only will I be able to experience things again through the human eyes, but also through the pure eyes of man’s best friend. And most importantly, not only have I been so deeply blessed as to have a relationship with my dogs that has transformed my life and who I am, but I’ll be doubly blessed to be of service by helping other dogs and their humans live a fuller life, together, as they have that same intense transformational bonding experience that makes life so much richer. Guiding people traveling with dogs – what more could any one person hope for? Simply book one of our amazing tours at happytailstours.com/tours and show up with your dog. Nature, your dog, and Happy Tails will take care of the rest! Worlds First Official Canine Adventure Tour is a Sold-Out Success for Happy Tails Tours! 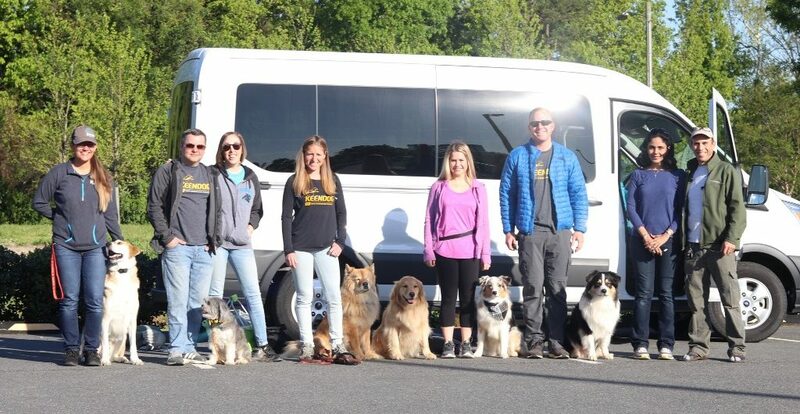 We are incredibly excited and grateful to announce that Saturday was the official launch of our new company, Happy Tails Canine Adventure Tours and we kicked it off with a sold-out inaugural tour to northern North Carolina. 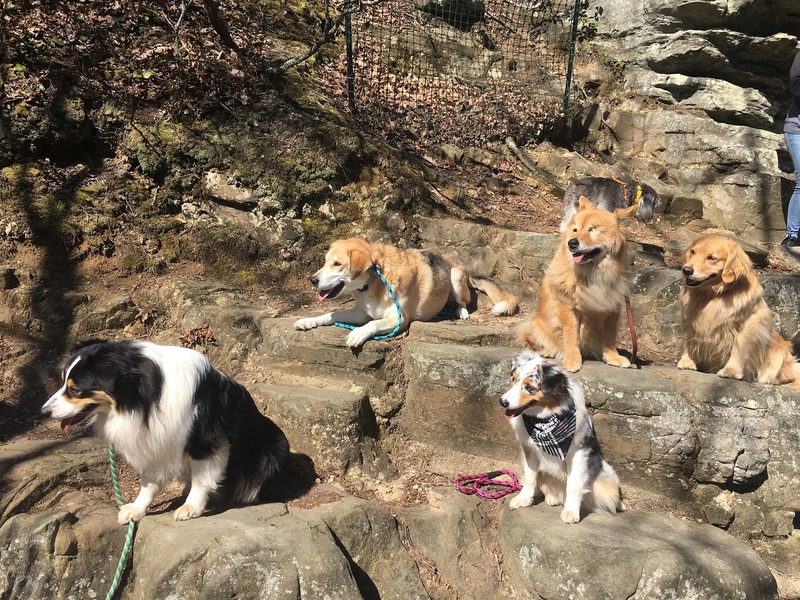 We started the day with a great hike at Pilot Mountain State Park, followed by lunch and wine tasting at two great and very dog-friendly wineries in the Yadkin Valley – Ragapple Lassie Winery and Misty Creek Vineyards. When asked by Ellie Porter what was the best part of the day for me, my first reaction was “Leaving my house in the morning, knowing that our vision had become a reality!” But, the whole day was amazing! Seeing everyone have such a fantastic time with their dogs and each other, hearing everyone’s enthusiasm and positive thoughts about the tours and the concept, hearing the conversation in the bus as everyone laughed and shared their experiences and their love for their animals, were all great. Claudia and I are blessed to be creating our vision. Besides the most important thing, which is that our guests had an amazing experience traveling with their dogs, the icing on the cake that confirmed 100% for me that Claudia and I are indeed on the right track, was that Chris McPeck, who was playing live at Misty Creek, closed his set with Wonderful Tonight by Clapton. That was the song of our first dance at our wedding and when I heard it I grabbed Claudia and we danced and we both felt such an overwhelming sense of gratitude, joy, and contentment. I am just so, so grateful to have this amazing person by my side as my partner in life. Thank you so much to the great people who attended, including Tamara Lyn Rivera, Eric Rivera, Nicole Carpenter Adams, Jamie Adams, and from KeenDog owner Katrina Kensington and trainer Ellie Porter, as well Austin Chaney. Claudia and I have been slowly working on this idea for several years and have dedicated ourselves full time since January to creating this amazing company that will give others the opportunity to have amazing, life-transforming adventure experiences with their dogs. It has been a lot of work, a labor of love, the culmination of which was realized Saturday, April 21st, 2018. Thank you everyone who has been supportive of our vision in so many ways. If you are so inspired, follow and like our Facebook page @happyTailsTours and follow us on Instagram @happyTailsTours to see what amazing adventures are developing. Thank you!! It happened in an instant. One minute the old man was down standing in the water of the Panama Canal. He couldn’t see well and he was almost deaf. I had been calling him, yelling for him to come for five minutes. But he didn’t hear me. Maybe it was selective. He was probably just enjoying himself and at 14 and a half years old didn’t have to listen to anyone. I’m glad he did. Ten minutes later he was gone. I just finished bathing and drying him, his body. It was clear that’s what it was. I didn’t feel anything else there. And I felt very alone. Less than alone. I feel as if part of me is missing. On a Friday afternoon in May of 2000 I received a phone call from a woman at the Australian Cattle Dog Rescue Association. I had been speaking with her a few weeks earlier trying to adopt a dog, but their policy was to not give dogs to anyone without a home with a yard. She called me because she felt I knew the breed and what he would need, and had been told of a dog in the animal shelter an hour away in Delaware. When we got there Saturday morning, they had to drag him out of his cage. He was not friendly and not to trusting. They had me go into a small room about 15 feet square and then put him in with me and shut the door. I took a chair and put it against the center of a wall away from the door. He went and sat in the corner closest to the door. For five minutes neither of us moved. We just stared at each other. Finally he stood up. He walked over to me slowly and sniffed my leg. Then he lifted his leg and urinated on my legs. Then he jumped up into my lap and licked my face. He has never willingly let me out of his sight since. I filled out the paperwork and we left. We took him to a beach and played with him in the waves. In the pound they had called him Blue. He had been a stray and they didn’t know his name. So we sat at the beach and whenever he turned away from me I started calling out names. I started with the A’s and worked my way through the alphabet. When I said Max, he immediately turned and looked at me and then came over and rubbed against me. Max it is!! That was almost 13 years ago. A few days later I went in for a job interview. I had recently been downsized. It was the second interview and I was offered the job. It would be hard work, 80 hour weeks, but great money and a stake in a new company. I accepted. When I got home an hour later, Max had destroyed some of my favorite things. I was furious. I wanted to kill him. So I sat down and breathed and thought. And I came to the conclusion that he was right. After almost two years in a corporate job after graduate school, I realized I didn’t want to spend all my time inside any more either. I picked up the phone and called the employer and told them I was going to have to pass on their offer. That was the first time Max saved me from myself. 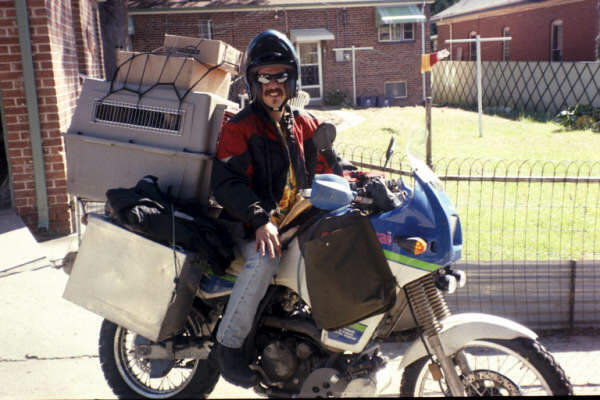 A week later I purchased a small plastic airline kennel and strapped it onto the back of my motorcycle for our first test run. I shoved Max in and we went to the park a few blocks away. When we got off the bike and went into the park to play, I put my helmet on the ground and went to pick up a stick to throw for him. He walked over and urinated on my helmet. He might as well have spoken to me. It was clear he wasn’t happy with things. So I put on my smelly helmet after a quick rinse in the fountain, shoved him back into the crate and went home. I dropped Max off and went out and traded in the kennel for a larger one. I took it home, strapped it onto the bike. Max took one look at it, jumped up on the seat and into the crate and sat down, ready to go. Three weeks later we took off on a 1 year journey through the US, Canada and Mexico. We traveled over 20,000 miles camping and exploring and he was the best friend and companion I could have asked for. Only twice did he refuse to jump up onto the bike. The first time was when the crate fell off going over a mountain pass in Colorado at 5 miles an hour. He was not happy. Not injured, but not happy. The second time was when we did an 18 hour day from Los Angeles to New Mexico. I didn’t want to get back on either. Max traveled with me through ten countries in North, Central and South America. He protected me at night when we camped out. He attacked the police that tried to rob us in Mexico. And he was my friend. He saved my life and he changed my life. He has been rafting, kayaking, tubing on the Rio Grande and flying to South America. Today I was helpless to save him when he was caught in an Africanized bee’s nest. I tried to grab him and was covered myself and couldn’t get close. We both ran, he the best he could. I raced to a restaurant up the street and stole their fire extinguisher. I raced back and blasted the bees off of him. He was already out of it, covered with bees and unable to move, probably in a coma. We raced to the vet but when we got there, it was too late. I’m so, so very sad. He was my friend. So now I just keep remembering him standing in the water before it happened, looking happy and free in his old age. Every day of his life was a blessing, since that first day at the pound. And I am so very grateful to have been part of that. Thank you to everyone over the years that have loved him and been his friend. Tomorrow we will find a place in the jungle and bury him. On a Saturday morning In May of 2000 I adopted the first dog of my own as an adult, Max. 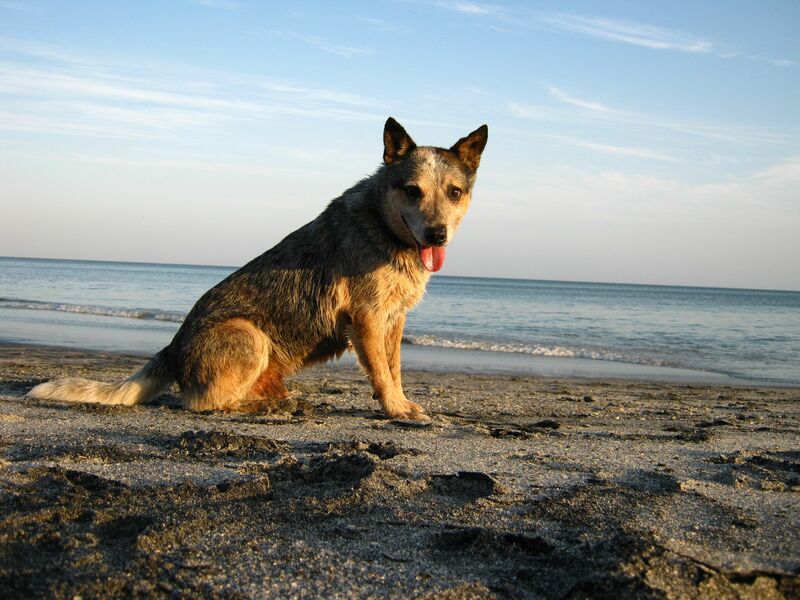 He was an 18 month old, 45-pound Australian Cattle Dog. He’d been in a shelter in Delaware for 3 months minus a few weeks with a family that didn’t work out, and was scheduled to be euthanized Monday morning at 6 am.Three weeks later Max and I took off on a 1 year journey through the US, Canada and Mexico. We traveled, camping and exploring, for over 20,000 miles by motorcycle. Max rode in an airline kennel mounted onto the back, and he was the best friend and companion I could have asked for. Only twice did he refuse to get up onto the bike. Over our 13 years together, Max, who was joined by Dozer in 2005 and Margie in 2008, traveled with me through ten countries in North, Central and South America. He and Dozer protected me at night when we camped out. They chased off the police that tried to rob us in Mexico. They have been rafting, kayaking, and tubing on the Rio Grande. They are well known amongst many of the indigenous groups we worked with in Panama and have been in many areas of the jungles that few non-natives ever visit, and they are in more tour client photos than I have. Max was my friend and constant companion. He saved my life and he changed my life. In 2010 I took a couple of ladies on a private camping tour to a small private island off the coast of Panama, inhabited by only one family. I had always taken the three dogs, Max, Dozer and Margie on all of my tours and this was no exception. When we arrived to the coast to meet the boat for the trip to the island, I unloaded the equipment, luggage and dogs from my truck. That was apparently the first time since we had left Panama City 2+ hours earlier that the ladies had noticed the dogs. They were polite but visibly concerned. “Do you always take your dogs?” I replied that I do. “Does anyone ever complain?” I had to think back but the answer was no, never. Over the years so many people who had seen me traveling or who had been on my tours had expressed how much they wished they could travel with their dogs, and I was grateful for my good fortune to be able to do so. That is when the idea for Happy Tails Canine Adventure Tours was born. I knew that I had to come up with a way to help others to travel with their best friends. And, now it’s finally coming to fruition. They say that humans are attracted to pets and especially dogs because they give us unconditional love, but for me I think its because they give me the opportunity to love unconditionally! So keep the rubber down, the wind in your hair and the tails wagging! The best is yet to come.